UMP | University of Minnesota Press Blog: Another year, another busy MBA -- this time with more paparazzi. Another year, another busy MBA -- this time with more paparazzi. 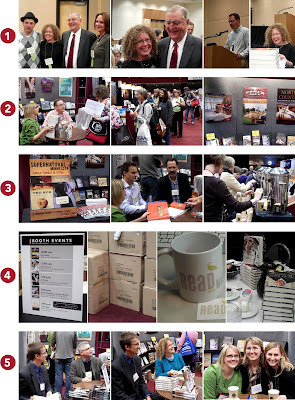 From a glowing endorsement from Walter Mondale to a very busy booth day, the 2010 Midwest Booksellers Association meeting left us with much to be excited about. Row 1: Photos from the author's breakfast, which featured speeches from Jonathan Evison (West of Here), Laurie Hertzel (News to Me), Walter Mondale (The Good Fight) and Antonya Nelson (Bound). Photo #2 was taken after Walter Mondale made a beeline over to Laurie Hertzel to have his copy of News to Me autographed. Photo #3 is Chris Livingston, manager at The Book Shelf in Winona, MN, who introduced Laurie before her speech. Row 2: Our book signing with MPR's Peter Smith, and the huge line of fans waiting to get their copies of A Porch Sofa Almanac autographed. Row 3: Announcing our newly back-in-print books in Thomas Disch's Supernatural Minnesota series (The Businessman, The M.D., The Priest, and The Sub); author Michael Nordskog (right) and photographer Aaron W. Hautala autograph copies of The Opposite of Cold; caffeine-hungry MBA attendees visited our booth for an afternoon jolt. 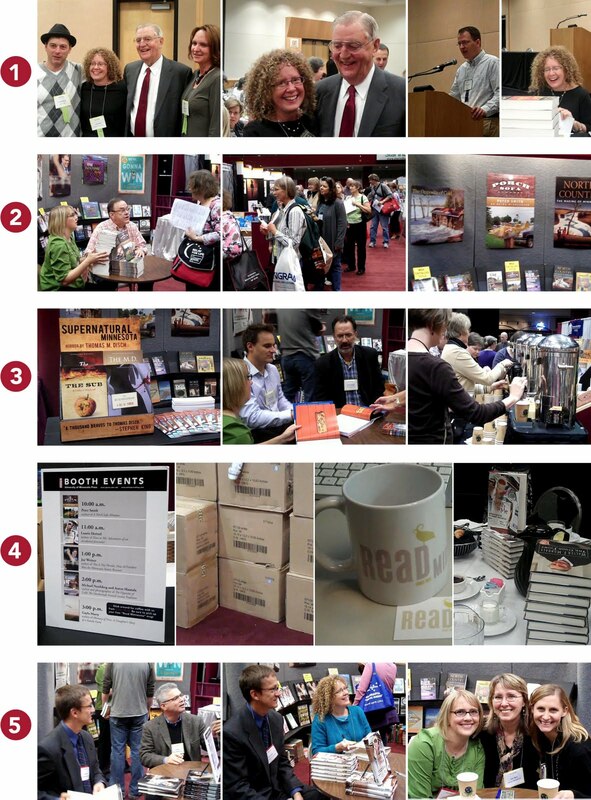 Row 4: Our lineup of the day's events; the Read Minnesota mugs we gave away and the multiple boxes we brought; and stacks of books at the MBA author breakfast. Row 5: Author Jay Weiner (This Is Not Florida) chats with a fan as editor Todd Orjala looks on; author Laurie Hertzel (News to Me) signs books; author Gayla Marty (middle, Memory of Trees) poses with publicist Heather Skinner (left) and marketing director Emily Hamilton. Want more MBA info? Check out Claire Kirch's writeup in Publishers Weekly.